for Soil Testing - The unit consists of a pressure vessel with clamp for sealing cap, capacity is 20 gms. Rubber sealing gasket, pressure gauge calibrated in percentage moisture content 0-25% x 0.25% on the wet weight basis, an electronic balance for weighing sample, a scoop for measuring carbide reagent, a bottle of reagent, one cleaning brush and a set of 4 steel balls for thorough mixing . 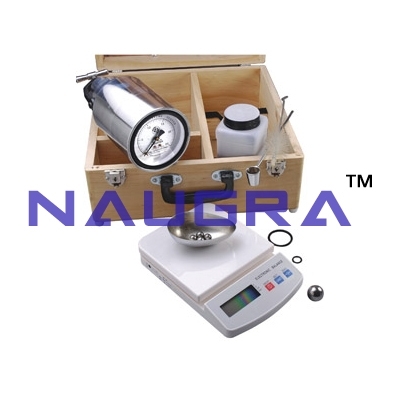 Complete in highly polished wooden carrying case with handle..
We are leading manufacturers, suppliers & exporters of Speedy Moisture Meter (D2 Large) For Testing Lab for Soil Testing Lab. Contact us to get high quality designed Speedy Moisture Meter (D2 Large) For Testing Lab for Soil Testing Lab for schools, colleges, universities, research labs, laboratories and various industries. We accept bulk orders for government tenders in all countries around the globe.